The Ionian Singers is a chamber choir of about 25 singers with a national and international reputation based on performances and recordings. festivals and music societies. They tour regularly abroad and have broadcast in the UK and Europe. They rehearse in central London. 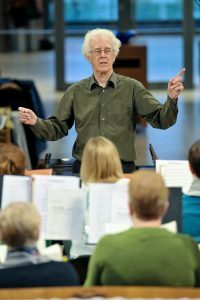 The choir is known for its commitment to new music, has given many first performances and has commissioned new works from several British composers. The programming and recording policy of The Ionian Singers is to search out less familiar and unjustifiably neglected repertoire both sacred and secular from the 16th century to the present.